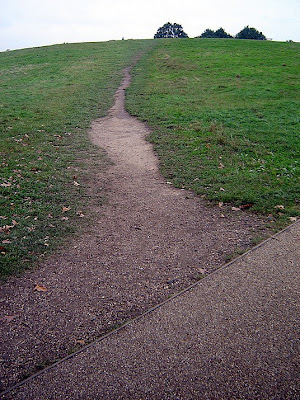 [BB-Blog]: Phrase of the day: "desire path." Phrase of the day: "desire path." 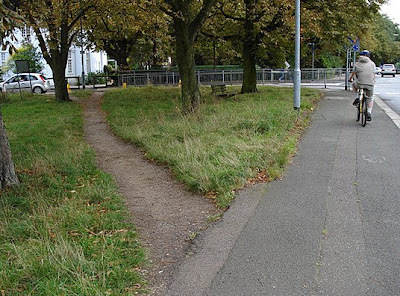 Desire Path: A term in landscape architecture used to describe a path that isn't designed but rather is worn casually away by people finding the shortest distance between two points. love this so much. i do not know where you come across the random things you do, but thanks for sharing them! The one I bike on every other day is getting ridiculously wide... I hope they're going to pave it some time soon before there's no green left! oooh i love this peice of info! and so appropriately named too! Love this post. I went to Anderson University where there were paths like this criss-crossing the campus through the campus "valley," as they call it. They ultimately paved those paths and made them semi-official. People will always want to take the shortest route from point A to point B!